Mayor for a send off from Adelaide House. The BBC, ABC and Imparja (Channel Eight News) were all in attendance. We made our way out of the city and had travelled 6 miles when I had my second puncture in as many days, the tyres are obviously getting near to the end of their life and ready for a change. We set off once again and for once the usually now straight road took a sharp turn to the right ,the wind had been strong since leaving Alice Springs, but was now straight in our faces. The day was going to be hard with no give ,even though the road was to be flatter than usual. The scenery changed today becoming more barren in places at times but looking very much like the Lowlands of Scotland, leaving the cold wind to embrace us even more. We have noticed more wildlife than of late, wild 'ferral' ponies and cattle. There have been an abundance of Eagles flying above our heads - a wondrous sight -they were after the fresh road kill. Governor of the Lions Club who was surprised that we had made so much ground. Tomorrow we will be setting off down the highway towards Erldunda, Desert Oaks where we will turn off and head west for one night to stay at Ayres Rock on Friday to do some final filming and return to Erlunda on Saturday evening. Sunday it will be all systems go when we start our charge towards Coober Pedy. Today was a very long day filming with the BBC, but we travelled south to Kulgera during a cold and blustery day,. This made the day feel longer and the whole team is feeling very lethargic on the whole. We have made very good ground today and probably had the best day of the journey. progress from the beginning and we clocked 18.2. miles in the first hour and another 18.5 in the second hour. I clocked 1 hr 25 mins and 25 secs for the marathon distance. We covered 91.8 miles to finish North of a place called Marla. 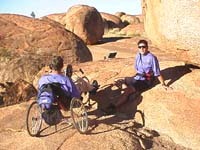 Jon and Simon take a break near the Devils Marbles.